Did you know that there are over 450 Roman villa remains in the UK? I did not know this. I very stupidly thought that about 20 Romans came over to Britain; a few of them stayed in London and built a couple of things there, a few went north to sort out Hadrian's Wall, and a few went to Bath. But I was wrong, as usual. 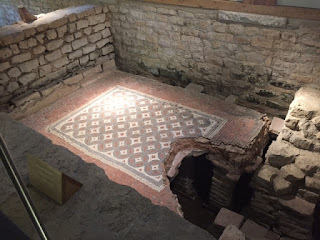 A quick look on Wikipedia shows that even in my home county of Northamptonshire there are several villages that I thought were entirely featureless that actually have the remains of a Roman villa in them. Amazing. 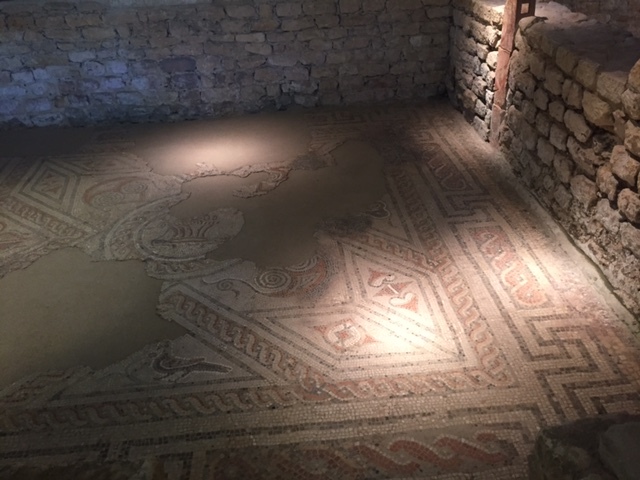 Thanks to a lovely tour guide called Julian, I learned a lot more at Chedworth Roman Villa near Cheltenham today. We hadn't planned to join a tour, but one was starting as we arrived so we tagged along expecting to wander off at some point. But an hour later, I was still hanging on Julian's every word as he pointed things out that we would never have noticed without him. 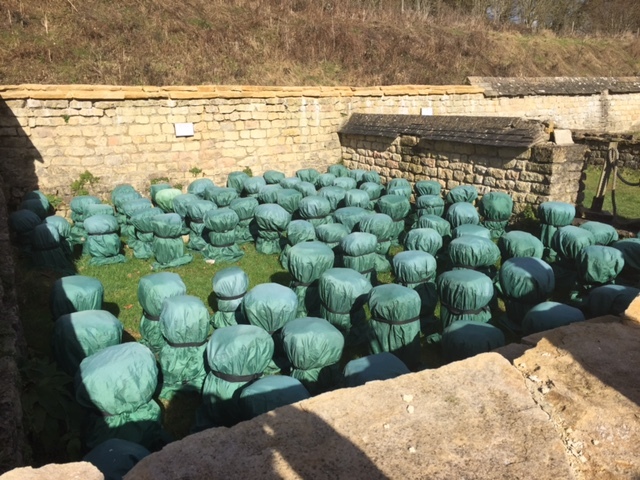 So Chedworth Tip One: join the tour. He built a museum in the middle of the excavated site on the spoils from the clearance - I was really disappointed by this, as I thought someone had accidentally built a house here and then discovered it was bang in the middle of a Roman villa. But no. 4. What is there to see? 5. What didn't we see? Snails. Apparently the Romans liked eating snails and brought some of their favoured variety with them. A few plucky gastropods made a run for it and escaped the cooking pot, taking up residence in the vicinity AND THEY'RE STILL THERE TODAY! Not the same ones obviously, but their descendants continue to squelch their way around the villa 1700 years later. More mosaics. 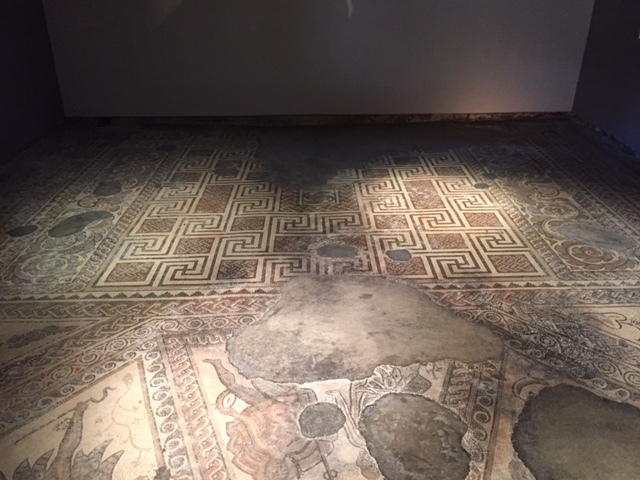 Amazingly, some of the mosaics were covered over again post-excavation, as they'd be destroyed if left open to the elements. So you walk round on grass verges knowing that there are stunning patterns beneath your feet. I was very disappointed by the lack of scones but let's be clear; this was scone mission #153. 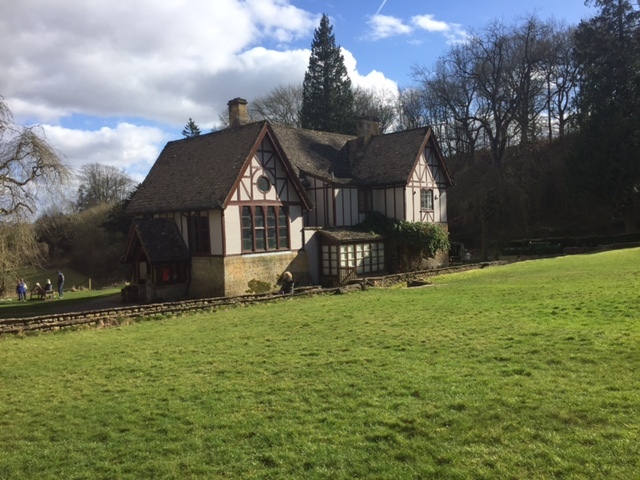 My rough guess is that of 153 properties visited, only five have failed to deliver scones when I would have expected some to have been available. That's not too bad. Anyway. 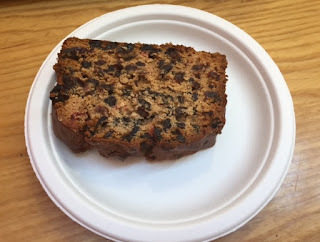 I had dragged the Sidekick some distance and we were both hungry, so he had carrot cake and I had fruit cake. And they were both DELICIOUS. for the photo. Then I tried it and it was absolutely lovely. I've been pretty lucky with this Scone Odyssey so far. Every time a scone fails to materialise or impress, the property turns out to be brilliant - see also Penrhyn Castle and Coleton Fishacre. 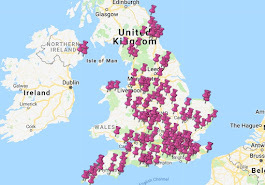 With 100 properties left to go, long may that continue. 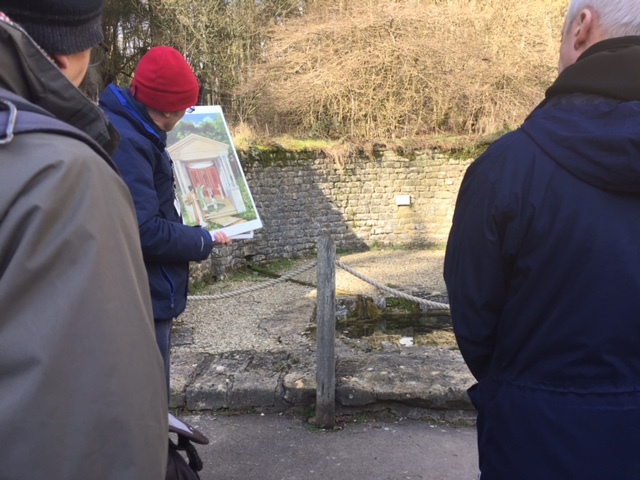 * I don't know what it would be like if you didn't follow a tour guide, but I'm guessing it wouldn't be as good. 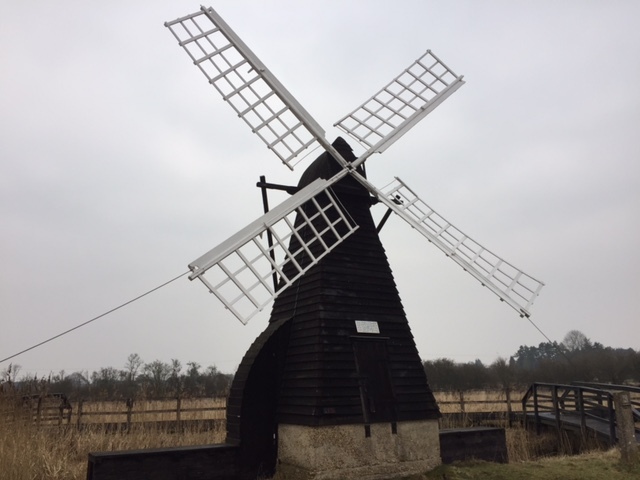 I was extremely excited about going to Wicken Fen near Cambridge today, mainly because it has a windmill. 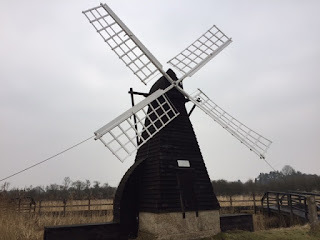 I suspect that anyone born in the UK in the 1970s loves a windmill, thanks to legendary TV show Camberwick Green and its triangular-haired hero, Windy Miller. 2. Wicken Fen is renowned and revered for being home to 9,000 species of fauna, flora and wildlife, but you'll struggle to spot 8,999 of them if you visit on a sleet-ridden day in February (we saw a robin). That's a heinous exaggeration, before anyone complains, but to get the best out of Wicken you probably need take your binoculars on a spring or summer or autumn day, which I will do when I return. Before we set off for Wicken, I knew what The Fens were, but I didn't know what they were, if that makes sense. Luckily they have a really good visitor centre and a very helpful guide book that explains it all, even if the guide book does contain about 20 words that I have never heard before in my life - "lode" anyone? "Carr"? The wind pump is the only one left - there used to be 1000s of them in the area, pumping water out of the turf pits so that the peat could be dug. Amazingly, it's still in working order. the value of the insects and wildlife that it attracted. Well done, sedge. 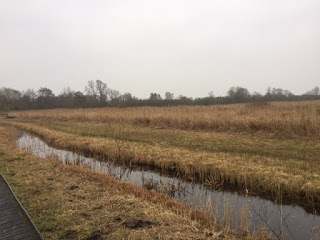 I read later that there are boat trips you can do on the fen from Easter to October - read about them here, as they sound fantastic and you should try and go on one. 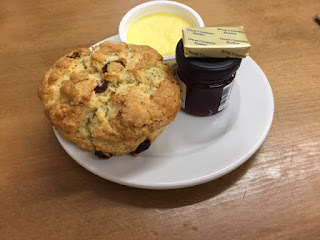 But while the Victorians might have come to Wicken looking for a long-winged conehead cricket, or a marsh dagger moth, my sights were firmly set on finding a tasty scone. I was accompanied to Wicken by my trainee sconeologist mum and sister. 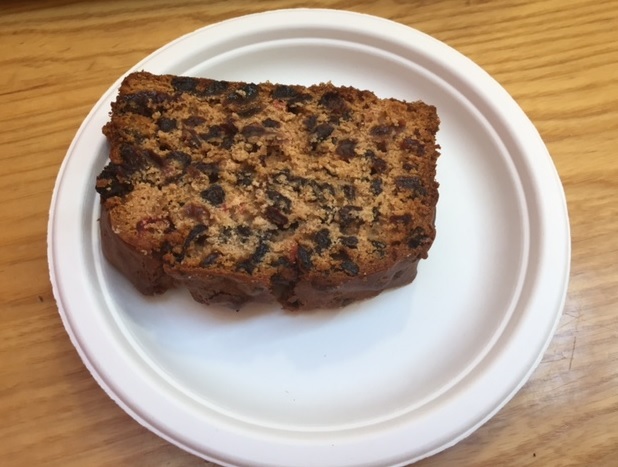 There was only one fruit scone left on the counter when we arrived in the tea room and we all looked at it, them presumably wondering how we were going to cut it into three and me wondering how I was going to break the bad news to them. However, the lovely assistant checked the oven and said more scones would be available in 5 minutes' time, so a fist fight was averted. The delivery of three hot scones to our table meant that Wicken Fen walks away with the award for Freshest National Trust Scone EVER. 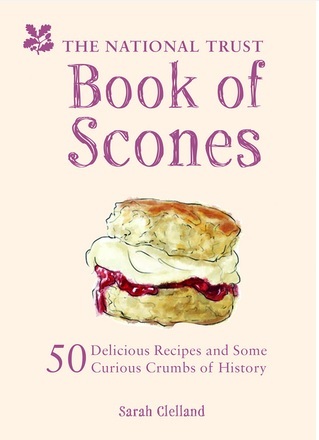 It was tasty as anything and it looked fantastic - a big chunk of a golden scone befitting a cold and gloomy day. I've always said that it's hard to ruin a fresh scone but even when I tried really hard to find something wrong with it, I couldn't. A triumph. 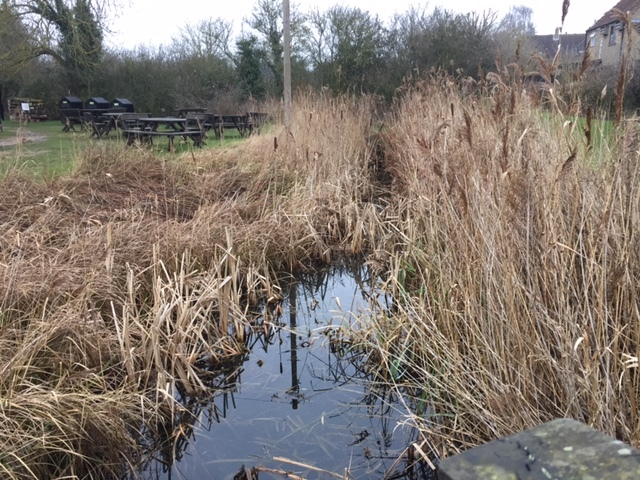 So there you have it - if you head to Wicken Fen on a nice day, you could see everything from a water vole or an otter to a hairy dragon-fly AND you'll get a fantastic scone.